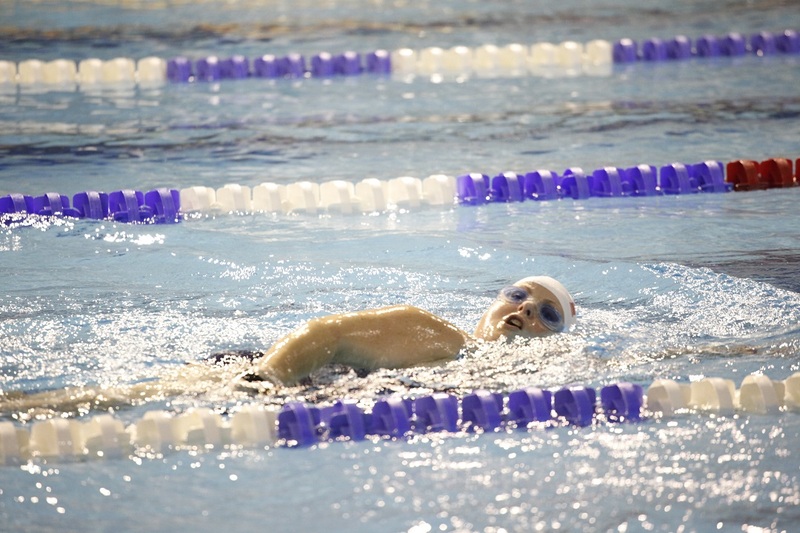 I’m no stranger to the NAC – the National Aquatic Centre – and its fantastic 50 metre Olympic length pool. 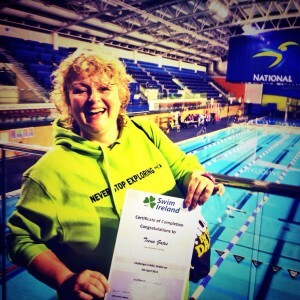 But when I turned up for the Swim Ireland ‘Swim For a Mile’ challenge, I felt as if I was a rabbit caught in headlights. For some reason, when I saw hundreds of swimmers all registering and lining up to take their place in the pool, I had a sudden fit of nerves. I suppose my lack of training was partly at fault. I’d started swimming for the event a couple of months earlier and had actually covered the distance one morning with some of my buddies from the Eastern Bay Swim Team. 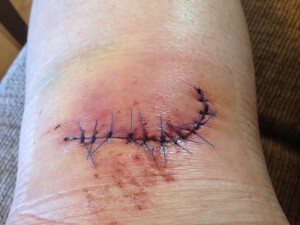 But I slipped and fell while out running in the hills and ended up with 12 stitches in my knee. That brought an abrupt halt to my swim training, both in the pool and the sea. Turning up for the actual challenge at the NAC was the first time I’d been swimming in weeks. I didn’t know how my leg would work, and whether I’d be able to finish the distance at all, not to mind within the allotted time. I mentioned my concerns nervously when I registered, and one of the ladies reassured me that no-one yet had failed to complete the course. Somehow I didn’t find that reassuring! 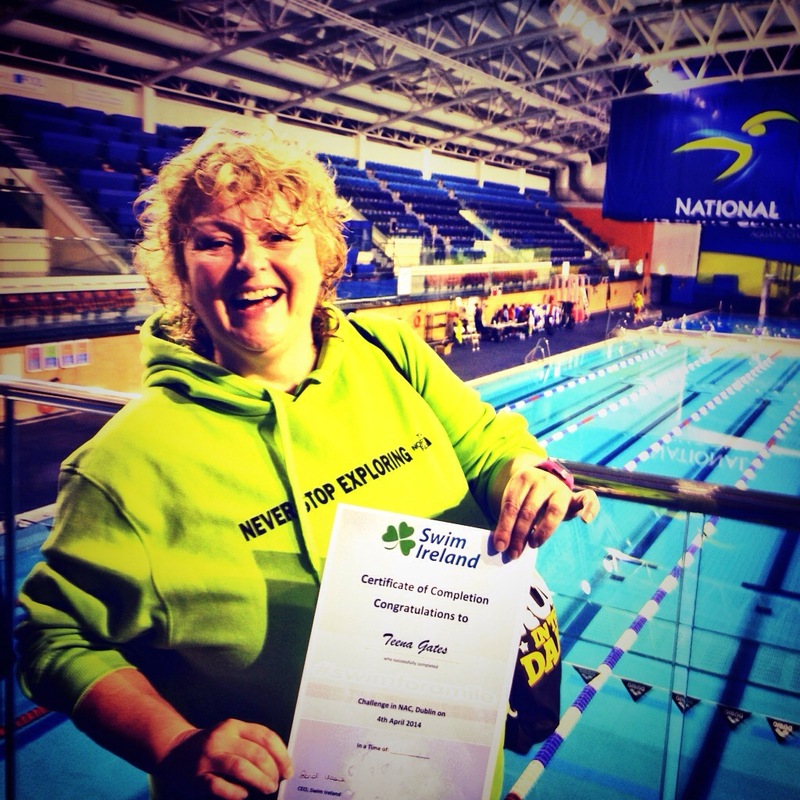 So with pressure building, I collected my timing chip and Swim-Ireland swim hat and made my way to the changing rooms. The other girls were great, and lots of swimmers seemed a bit nervous as we headed out to poolside. The loudspeakers crackled with a lively MC who welcomed us to take our lanes and gave us welcome instructions. 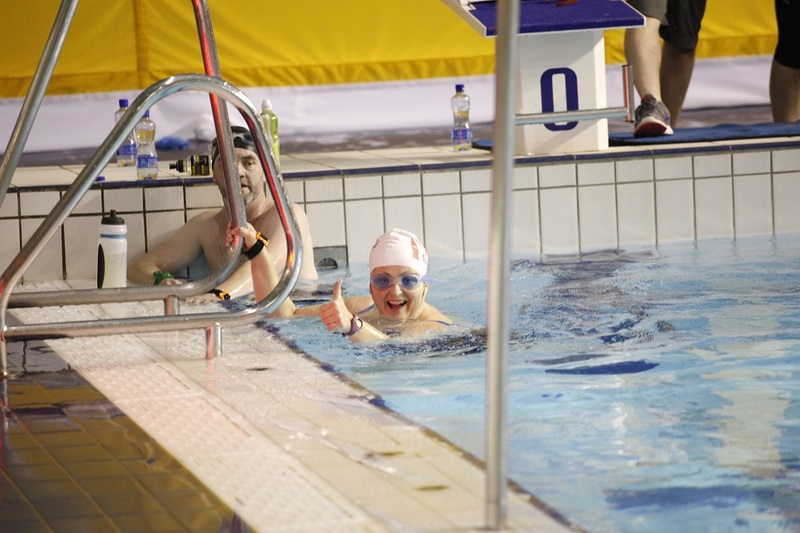 Swim sponsors TodayFM were very much in evidence, with ‘The Last Word’ presenter Matt Cooper already in the pool and clocking up what must have been his 5th ‘one-mile’ swim in a week! There was a great atmosphere among all the participants and supporters. From snatched conversations and comments overheard among other groups of swimmers, I grasped more than ever what a really great project this Swim Ireland challenge is. It’s brilliant for raising awareness and funds for charity. But it’s also an amazing legacy for the country, in terms of the number of people who got out there and learned to swim for this challenge. 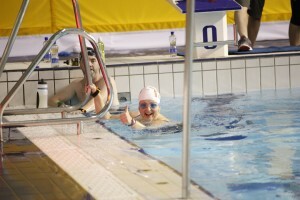 In just a few months, people of all sizes had got active and trained up to be able to ‘swim for a mile’. I don’t think we can underestimate what a great achievement that is. There was great camaraderie and friendliness as we all lined up to take our places; with loads of people shouting support from the gallery. For a moment I kicked myself for not bringing some mates along with me too. I felt a bit lonely as I got ready to slip my wounded paw into the pool. It was my own fault, I hadn’t really decided to go ahead with the swim until I found myself parking outside! The starter went and we were off; and instantly I knew it was going to be alright. I got into a comfortable rhythm and prepared to enjoy the experience. I did. The leg was fine, I didn’t need to pull up, I wasn’t too slow to finish. Everything was cool and it was great to be a part of such a massive effort by so many people. Well done to everyone involved, particularly all those ladies I met who were new to swimming, but who now have a wonderful gift that will last them a lifetime. What a life-changing event this is. I’ll definitely do this again and I’ll encourage as many of my friends to swim as possible; and if they really can’t swim, then next time I’ll take them along to cheer us all on. Roll on the next ‘splash-down’ at the NAC. Walking across the grass at Griffeen Park this morning, I’m thinking of making a run for it and I’m not necessarily thinking of the start-line for the 5k… To be honest, I’m nervous and despite just finishing a ‘Couch to 5K’ course with my local running club, Le Chéile AC, I’m not sure if I should be here. I’ve hurt my knee recently and I feel like I’m starting all over again. 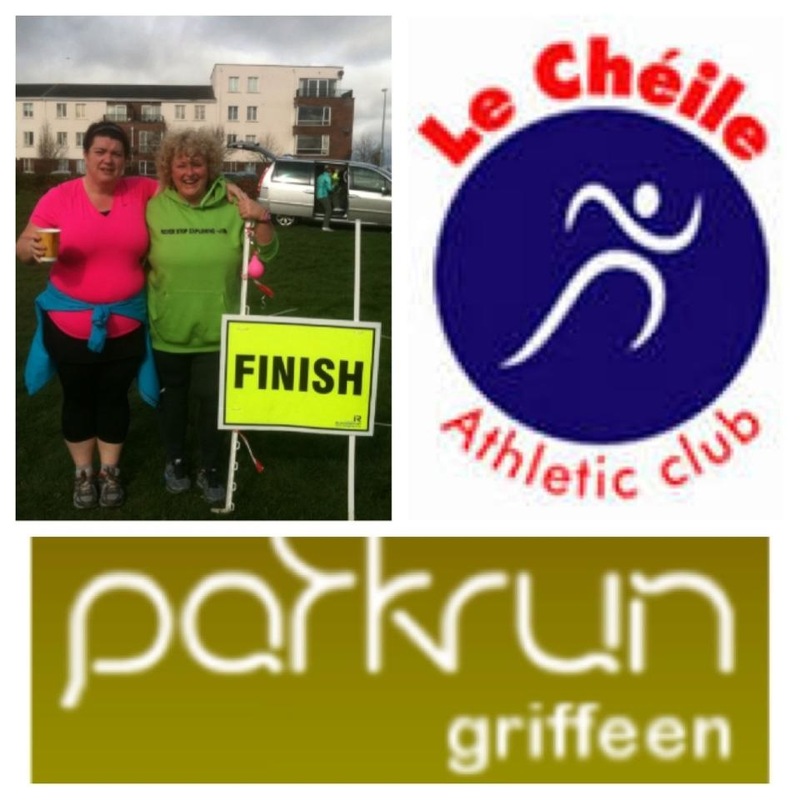 Any chance of taking to my heels in the wrong direction quickly disappears when I hear a shout-out from my Le Chéile buddy and Parkrun ‘first-timer’ Laura O’Flynn. Laura’s walking slowly towards me with the same rueful grin that I’m wearing myself. We both burst into giggles and hug quickly before we’re dragged into a friendly huddle with the group of athletes warming up at the start. That’s what keeps bringing me back to Parkrun. The warmth and friendliness of everyone involved. Julie O’Connor is there at the start-line, she’s another colleague from Le Chéile and is volunteering today – threatening us all with warnings about returning our race tokens after the run, and bringing us all together for the briefing. 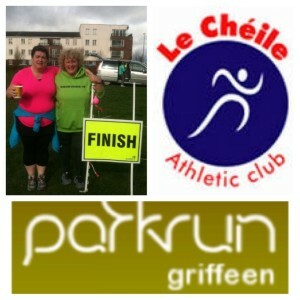 Volunteers make Parkrun possible. 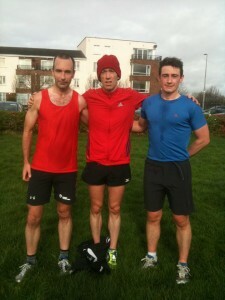 At venues all over the world at 0930 on a Saturday morning, runners gather for a timed run over a set distance of 5k. The route is flagged, and your membership is free. You register beforehand online, print off your barcode, and bring it along on the day. After the run you take your finish token, get your barcode scanned, AND RETURN YOUR TOKEN TO JULIE…. Otherwise next week the process is complicated for the volunteers who have to write in those times by hand. Message delivered? (Hopefully Julie’s just put the cheque in the post). First Male home Declan Fahey, followed by Conor Burke and John O’Regan. That’s the technical bit over. What’s harder to relate is the pure pleasure of the run. It’s daunting being a ‘newbie’ for anything, and for folk like me who don’t find running easy, it’s really scary to turn up and run alongside proper athletes. The thing is no-one here thinks any less of you if you’re not a speedie. In fact you just get a louder shout-out from the flag-watchers as you make your way around the course. It’s all about the support and all about the participation. Laura warms up alongside me for her first ever Parkrun; while Irish International Ultra Runner and Le Chéile star John O’Regan passes us by with a grin and a friendly wave. Then we’re off. I’m starting slow and getting slower, my knee had 12 stiches and although the sutures have been removed, I’m determined to take it easy. The knee actually feels ok, but I can feel my lack of fitness burning in my lungs as I head off around the first loop. Laura is running beside me and she’s moving easier than I am. It takes a lot of persuading to make her run on ahead. Laura’s being loyal, but the best thing about Parkrun is that although it’s a social event, it’s really a solo-run because you have your own personal time to run against. I’m not running against Laura or any of the runners ahead, and I’m certainly not running against the elite athletes who’ve already finished the course! I’m running against myself, content in the knowledge that the fantastic volunteers will be feeding everyone tea and coffee afterwards, which means the park won’t be empty – even by the time I finish. I hurt myself recently. I took a tumble while running up above the city in the Wicklow hills and I ended up with 12 stitches in my knee. It’s going to take me several weeks until I’m fit again, but far from turning me off mountains, it’s actually made me love them more. 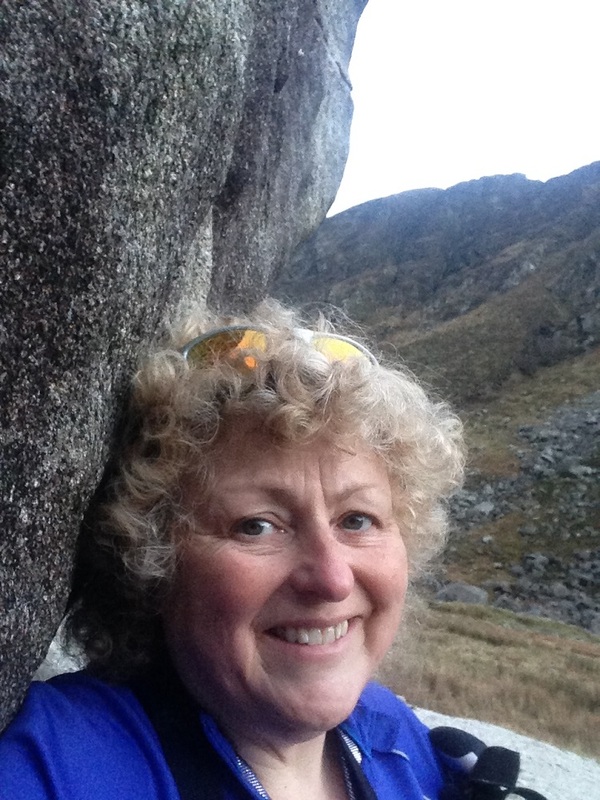 As a recent recruit to adventure, I have missed out on years of trekking and hiking and have been playing catch-up when it comes to learning the skills that come with playing in the great outdoors. I’ve been fortunate to hike with experienced, sports people who have been very generous in passing on their wisdom. I have also taken a couple of navigation courses, including my MS1 – and last year I took a really good First Aid Course with Adventure Training Ireland. I wanted to be useful if someone got hurt when we were out on the hills or rivers. To be honest, it never occurred to me that I’d be using those skills for a self-rescue. I also failed to realise the value of all that knowledge I was soaking up while hiking, climbing, paddling and running with super-skilled people who not only lead the way, but explain the how’s and why’s of doing what they do. A big thank-you to Pat Falvey, Tony Nation, Ronan Friel, Con Moriarty, Mike O’Shea, Ian Taylor, John O’Regan, Donnachadh McCobb, Adrian Hendroff, JuJu Jay from Mud Sweat & Runners, the lads and lassies at Great Outdoors, my mates in the Coast Guard, Irish Army and Mountain Rescue, Adventure Training Ireland, the Irish Ramblers, Mountaineering Ireland, Le Cheile AC, the Eastern Bay Swimming Club and the Wild Water Kayak Club – among others – whew! 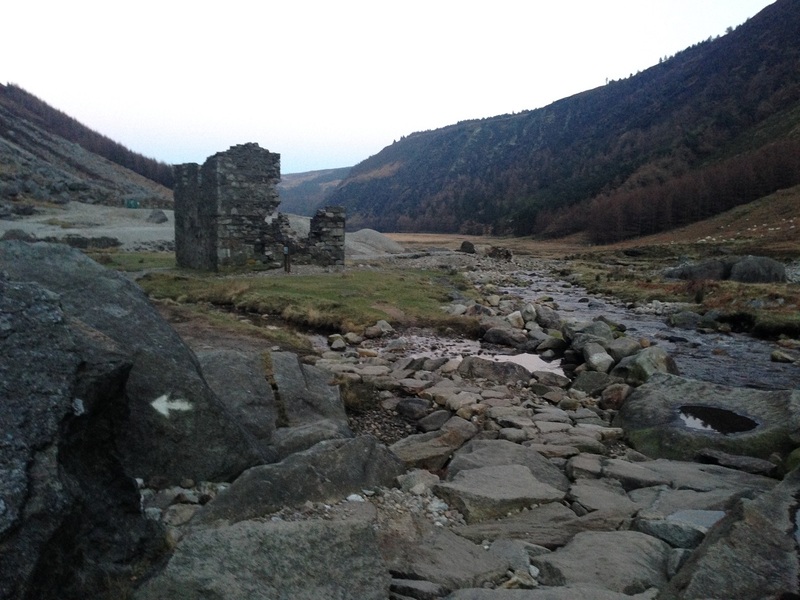 I’d spent a morning practising map-work on Camaderry in Wicklow and after lunch I headed for the familiar loop-trail around Spinc Mountain. I was picking up the pace in the afternoon and attempting to run the loop, to boost my fitness. I pushed up the 600 steps beyond the upper lake in Glendalough and in beautiful sunshine cleared the top of Spinc to begin my descent. Smiling as the trail dropped in front of me, I ran into a cool breeze. I was sweating and hot, and glad of a break from the sun as I ran into the shade of the mountain. The smile was snatched quickly from my lips as my feet hit a lonely slick of ice, a shower of rain, frozen onto the eroded wooden sleeper trail and hidden from the early sun. I wobbled, and flew at full speed forwards and down onto my knees, slicing into a lone, unlucky rock. Could I stop the bleeding? Would I faint? Instinctively my hand reached down to a stinging in my knee and several thoughts collided; it felt strange, the usual tension of skin on muscle was missing and I felt I was hugging a warm, sticky sponge. Looking down I saw my hand was red, and my running pants bulging below the knee, like a plastic shopping bag full of water. I don’t like blood and I should now be panicking. Instead I was zapping through an invisible checklist; I was injured but how badly, would I faint, could I stop the bleeding, did I have phone signal, what strappings did I have with me, how much food, water, where was my foil blanket, could I spend the night if I needed to, and if I decided to walk out – what was the most efficient way to go? If I went back the way I came, it would be shorter, but if I needed help the steps would be a problem for any rescue team coming after me. If I pushed on ahead, I’d make the gently sloping zigzags, the ground was more accessible and if I needed it, a jeep could reach me quicker. I quickly strapped my knee, took a couple of ibuprofen, lengthened out my walking poles, and using them as crutches, headed down towards the valley and the zigzags. It may have taken 10 minutes before I was back on my way and I was so relaxed I stopped to take some photos of the mountain along the way. 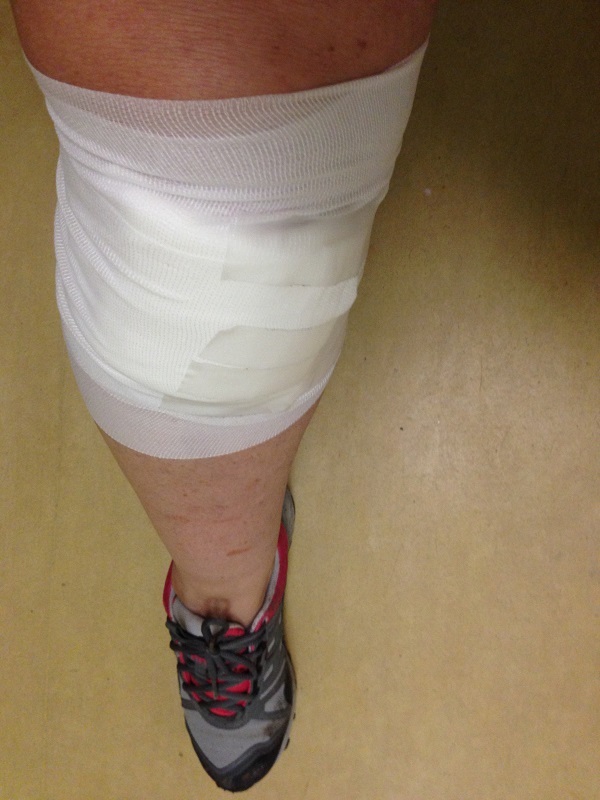 An hour and a half later I was down in the car-park and bound for A&E where a super friendly triage nurse bandaged me from knee to ankle while I waited the next 5hrs for 12 stitches in my knee. I’m not complaining. We know our hospitals are under pressure and I’m very happy with the job they did when they got to me. Dr Tom, you’re a saint, and thanks to your fine work, my leg is healing really well, without a trace of infection. I’m annoyed at being injured, being restricted from training, unable to do things I want to do for the next few weeks, but overall I’m grateful for my experience. What could have been a disaster, turned out to be a minor inconvenience and I’m really impressed with the way I coped – because believe me, I never considered myself to be that practical or useful! I really thought I’d flap, panic, holler and cry. When I was doing my first-aid, I commented that I’d never remember what I was being taught – and Donnchadh from ATI assured me that it’s common-sense knowledge that comes back to you, when you need it. He was right. I’m also intrigued that all those words of wisdom from my climbing buddies had sunk in so thoroughly. I remember walking chin deep through heather with Ronan Friel chatting about always knowing where you are, and how to plan your exit routes in case of danger. I really didn’t think that all that information had become so naturally a part of me. It gives me a whole new appreciation for the benefit of being informed, of taking courses, and taking responsibility for your own safety and the safety of others, when you’re taking part in adventure sports. Whatever I paid for those courses – they came cheap, when I consider what could have happened. Now I’m committed and inspired to go and learn a lot more. I was on my own when I fell in the hills, but people on the ground knew where I was and when I was due to return – one of the first rules of being out there in the open. I may not have done everything right, but I know I did enough right to get me down and out safely. I never expected to fall on my well-trodden, familiar, Spinc – but thanks to all the knowledge that has been passed on to me over the past couple of years, I was prepared for the unexpected.